OR, If you'd like to make a TAX DEDUCTIBLE DONATION - through the 501c3 - The International Documentary Association (DONATIONS MADE THROUGH THIS PAGE ARE NOT TAX DEDUCTIBLE.) Here's a link where you can make a tax deductible donation online via PayPal. 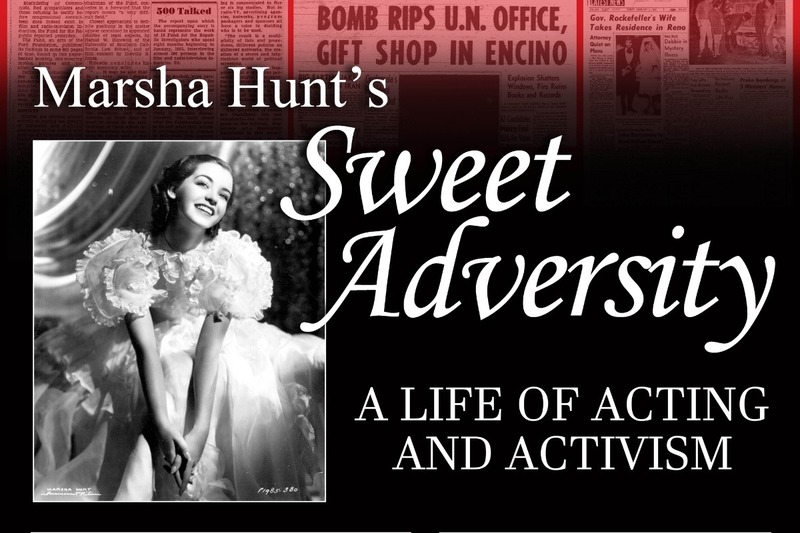 http://www.documentary.org/film/marsha-hunt-sweet-adversity?film_id=3094 I willl forward check on if you go through the IDA. Marsha has led an extraordinary life. After she was unfairly blacklisted - and her career in film, television and radio came to a quiet halt, she found a new passion as a humanitarian and activist. She WAS the first Angelina Jolie. Eleanor Roosevelt was her mentor when she started supporting the United Nations Association in 1955. She gave over 50 years to the U.N going around the country talking about the specialized agencies of the UN & the good work they were doing. She was one of Hollywood's first celebrity activists. Starting with World War II, where she worked almost every Saturday night of the war at the Hollywood Canteen- and for the next seven decades, Marsha raised awareness and funds for the homeless, the hungry, those with mental illness... the list goes on. In 2017, she celebrates 82 years as an actress. If Marsha has touched your life in ANY way, please show your gratitude by "paying it forward". Please HONOR her life by giving WHAT you can. Times ARE tough. if you can't give a donation, you can do your part by SHARING this with others who love Marsha. Let's get this film into THEATERS!! Please help me publicize this - I could use some publicity about the film.. SHARE THIS LINK..
Blessings to ALL and PEACE to all wherever you are in the world!! 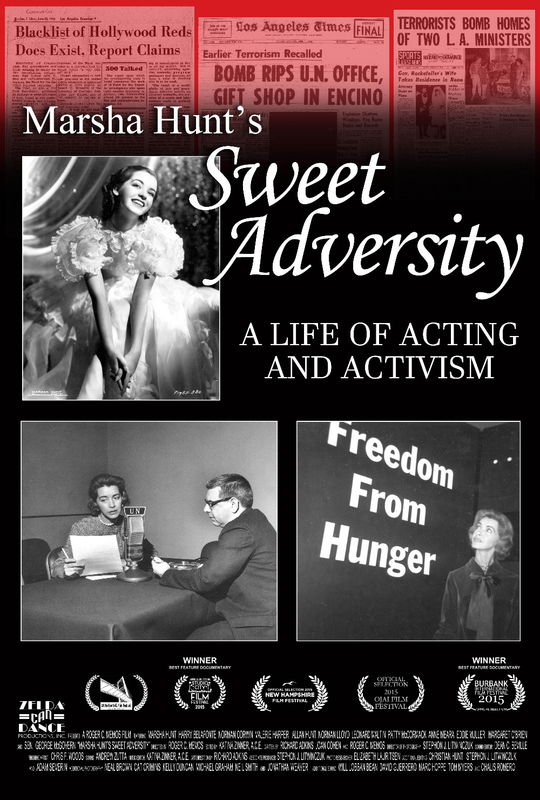 - Roger C. Memos, Director "Marsha Hunt's Sweet Adversity"
Good Morning all..I'd like to share the latest with the Marsha Hunt documentary... I'm THRILLED to announce that I am waiting for film distributor to countersign on a distribution contract! Once they sign, I'll be free to share more information.. This past summer, we had a successful run fo the film in Los Angeles and in October, 62 people braved a noresater to see the documentary in the Village ( we need to go back to NYC!) Still, all in all, about 900 people saw the film! I spent a good deal of my funding on this theatrical run- and now i need to do one final push of fundraising to get the documentary to the next level. The truth is, I can't keep spending my own money.. I'd like to raise a final $2000.00 to pay for closed captioning, a film trailer, clip licensing- and we need to eventually build a film website. Marsha is SO excited about the film's progress. She talk about it all the time. She will be 101 and a half this coming Wednesday, April 17th. Please consider making a small donation in her honor.. The documentary looks wonderful. Since trimming the film four minutes from the film we showed in festivals, it flows perfectly. What I am most proud of is that SO many people told me that they were INSPIRED by Marsha's activism and vowed to be more pro-active about supporting causes. This is a big part of why we made this film. Mission accomplished! Good Morning All.. I have two more stories to share on this last day of 2018. The problem with thanking people ( at least with me) is that I always unintentionally manage to forget people..Forgive me but i need to thank Elizabeth Lauritsen who oversees Marsha's archives and business affairs- as well as making sure Marsha is well taken care of at home.. and to Allen Hunt- thank you for always being there for your Aunt Marsha as well!! Hi All .. I wanted to end the year by also thanking our GREAT GREAT TALENTED film crew. Believe me when I tell you that it takes a village to make a film! I also want to say this.. I've watched a lot of documentaries this past year..And what sticks out in my mind is the immense amount of producers and financial resources they had to put together their projects. When I look at our "Marsha " film, I have to say that I am SO proud and amazed at what we accomplished with such limited funds. I am SO grateful for everyone who worked on this project - and we WILL persevere and finish up..Again, I hope to have the project ready for streaming and broadcast by April 1st. Please join me in thanking the following ..I am especially grateful to fellow producers Richard Adkins, Joan Cohen, Linda Goodman, editors Katina Zinner and Christian Hunt and Associate Producer/DP Stephon Litwinczuk!! Your message says 1:45. The ticket website says 1pm. Can you confirm the time please? For never-ending love of Marsha....and never-ending gratitude to Roger. I donated because Roger is a childhood friend of mine from Nashua, NH. Roger is one of the most genuine,hardworking people I know. The film will be as great as he is ! I love Marsha and Roger and this fascinating, inspiring film that opens hearts and reminds us why we're here. I believe so much in Roger C. Memos and all great work he has put into this fine documentary on the great actress/activist Marsha Hunt. I only wish I could donate more. Please urge others to donate.